The MCC Board of Trustees met on 11/20/18 at the College’s campus in Williamston. The President’s one-on-one meetings with every MCC employee has progressed nicely. 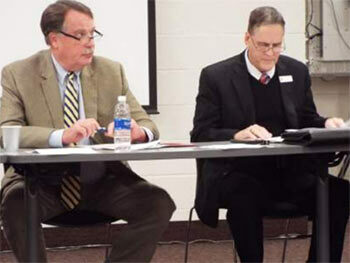 MCC Trustee’s Meeting Conducted on November 20 To date, there are only ten employees left to see. Billy Barber, MCC’s business and industry liaison, attended a recent Advanced Manufacturing meeting in Rocky Mount. The State’s Secretary of Commerce announced that there are 2,000 jobs in the pipeline. Work continues on transferring funds from MCC’s general fund to the Foundation and or one of its Fund Authorities. Clarence Biggs, a Foundation Board Member Emeritus, has established a scholarship fund for Continuing Education students. Unanimously approved a right-of-way for infrastructure to the county’s new 911 call center. Steve Taylor, MCC’s Dean of Administrative Services/Capital Project Coordinator reported that the campus door project is now on fast track and 90% of doors are done. MCC’s Vice President, Dr. Brian Busch reported on enrollment trends. He also noted that the Self Serve (online registration) beta groups going very well. Amanda Wells noted that employees can now access their W2’s and earnings statements on Self Serve. Dr. Hutchins announced that after 21 years of service, Mr. Willie Peele has submitted his resignation from the Board of Trustees. Trustee Jones agreed to serve as the interim secretary until Peele’s seat is filled. Peele is an appointee of the Martin County School Board. The Trustees also met on 12/18/18 at Deadwood. Their short business meeting to approve minutes and classroom designs was followed by a Christmas social. The next regularly scheduled meeting is set for 7 p.m. on 1/15/19, Williamston campus.